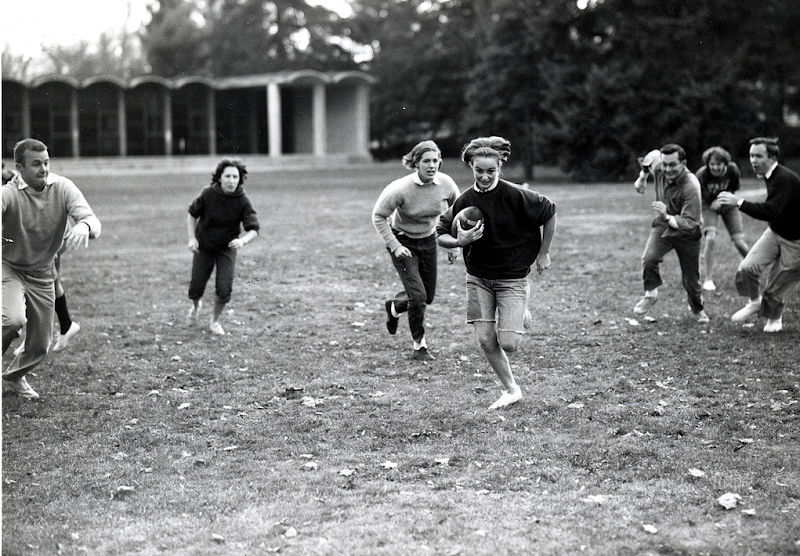 Photo of Vassar students playing touch football in October of 1962 in front of Chicago Hall via Vassar College's flickr archive, found thanks to Mariah at Quite Continental. Isn't it? I just wish I knew the exact year! I believe it's October 1962! It's been a long running joke that Vassar had no real football team to speak of, at one point there were even t-shirts that read: "Vassar Football: Undefeated Since 1865," the year Vassar opened! There's lots of funny stories about this month of on-campus touch football games both against men's colleges and then between the Vassar dorms... I'll find some of the articles I found during my research and post links/details! Lizzie - would you like to collab on something? I could share some great images/guest write something? HUGE fan, as you know! Ah ha! Leave it to the author of the forthcoming book Vassar Style to know the year and the month of this photo. Thanks Rebecca! This photo makes me so happy.